Growing up my mom didn’t buy many store bought treats and we didn’t eat a lot of store bought candy or desserts. I have tried to follow that with my kids. My kids have asked me to buy store bought granola bars to take to school or sports practices. I created this recipe so I could control the ingredients and still have a tasty treat. It’s very versatile and you can omit and add your favourite granola bar ingredients. This recipe can be changed if you want to omit the nuts (almonds & almond butter). 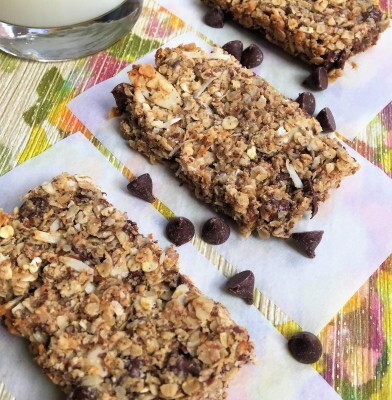 These granola bars can be added to your kids lunches. Instead of almond butter you can increase the oil to ½ cup. I start out with placing all the dry ingredients on my baking sheet and spread them out evenly and bake in the oven. I have tried to omit this step and the bars don’t have that toasted flavour and they also don’t hold together very well. While you are waiting for your dry mix to cool, you can whisk together the wet ingredients. This is such an easy recipe because all you have left to do is mix together the dry and wet ingredients and add the chocolate chips. Spread the mix evenly into your pan and bake. ​You will know the bars are ready to come out of the oven when they are nicely golden brown and also slightly hard to the touch. You must let them cool completely before cutting them up. I prefer them to be on the crunchy side but if you prefer them to be softer just shorten the cooking time a few minutes. Line 9 x 13 cake pan with parchment paper, set aside. 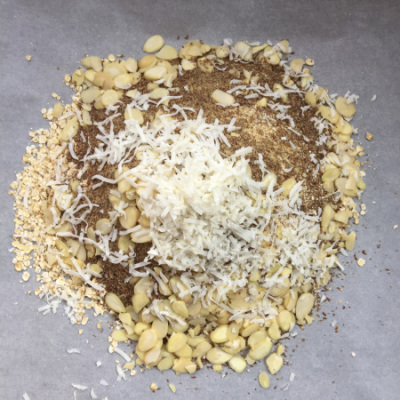 Mix together all dry ingredients: oats, oat bran, flaxseed, almonds, and coconut. Place your mix on a flat baking sheet lined with parchment paper and bake in the oven for 10 minutes, taking out half way thru to stir. Remove from oven and let cool completely. Meanwhile in separate bowl whisk together egg whites, salt, brown sugar, honey, grapeseed oil, and almond butter. 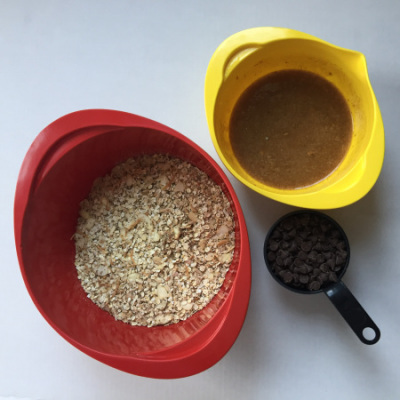 Once oat mix has fully cooled, add wet mix and chocolate chips and stir till combined. Spread granola mix evenly into cake pan and press down firmly to flatten, using a square of parchment or wax paper if the bars are sticking to your fingers. Bake for 16-18 minutes, until slightly brown.